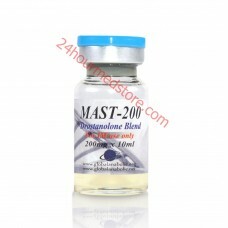 Global Anabolic Mast-200 is a mix 2 masteron esters: 100 milligrams of masteron propionate and 100 mg masteron enanthate. It's a fantastic anabolic steroid that has been structurally optimized to help you keep your gains, minimize side effects and increase power. While it really doesn't help you to see massive muscle gains or mass gains the strength and power that you can achieve with this mixture and the lien gains that you can see from dieting and cutting phases make it a powerful performance enhancing drug. Masteron was originally developed to assist patients with postmenopausal symptoms of breast cancer. It is extremely useful in supporting patients who are undergoing chemotherapy and breast cancer treatment. It contains fairly low androgenic and anabolic properties and is really more about leaning and promoting small strength gains rather than overall muscle mass. The mixture actually puts together two of the best Mesteron esters to help you with cutting and to promote lower doses making the process of dieting and cutting even when you aren't eating clean much easier. Mesteron Mix isn't so much about making huge gains in bulk. Instead masteron users enjoy the fact that they can experience massive gains in strength and weight loss. For athletes that have less than 10% body fat they can start to notice a much harder and dryer look almost instantly. Although the lien look might not persist in athletes with a little more fatty tissue, they can still experience a major gains when it comes to weight lifting and overall workout power. Most athletes generally take between 200 to 400 mg per day during a short term cutting phase. This mix optimizes the formula and ensures that you don't need to take any other cutting steroids during a dieting cycle. It's also usually a very good idea to take some anti-estrogen medications to counteract any potential estrogen related side effects. Most athletes generally cycled this mix as an off-season diet or cutting method or precompetition cutting method. You could consider a short-term 14 day cycle if you have low body fat and are preparing for competition or a longer 4 to 6 week cycle for an off-season cutting and training phase. Medication is definitely required to combat any estrogenic activity while you are going through the cycle and you will also need to have a proper PCT plan in place to keep your results. Although this steroid isn't quite as difficult to manage with PCT as others you need to prepare ahead of time.